Double-Decker motorhomes are often considered as “Motorized “Penthouses”. Indeed, this perception may be reflecting reality when it comes to some top-line luxury double-decker units. However it is also true that many double-deck motor-homes are modest “home-made” conversions based on commercial double-deckers. And usually they represent more “down-to-the-ground” living environment..
Double-decker motorhomes are not much popular (actually almost non-existing) in North America. It is mainly due to the law that limits the legal height of any motorized vehicle. And there is a strong reason for imposing such limit. Turns out that the clearance of most of US underpasses is limited to 13.8 ft (about 4.2 meters), while most double-deckers require more room. Such dimensions may not create any problems somewhere in the wilderness of Australian Outback's dirt roads, but will cause serious limitations (and danger) on most of US roads. In fact in many countries including Great Britain and some Commonwealth countries like for example Australia or New Zealand, the height limits are higher than in the US. That creates an opening and opportunities for double-decker motorhomes. Summarizing – double decker motorhomes are not a “fantasy”, they are part of the “healthy” business because there are customers willing to purchase such homes on wheels. Now for those still interested in double-decker RVs some practical information. Double-decker motorhome due to an existing extra level allows for more “home-like” “all-time-available” environment. Its internal layout is “fixed” with well -defined areas for sleeping, living and working (kitchen). They do not undergo frequent “reconfigurations” as all slide-out based designs. To answer the need for extra space, traditional motorhomes expand horizontally by incorporating “slide-outs”. They provide extra space but only in camping configuration. During normal “on-the-road” stops not only that you cannot use slide-outs, but actually, in their closed “slide-in” position they prevent you from fully using the existing internal space “at the will”. Slide-outs like any moving parts are prone to “malfunction” (we all know Murphy’s laws – “If something can go wrong, it certainly will”, and moving parts are first to prove this scenario. The most vulnerable parts of slide-outs are: moving mechanism and sealing rings protecting from weather elements. Sooner or later something will break and/or leak! In the same footprint, double-decker motorhome provides much more precious space than any motorhome with slide-outs. These days you can find motorhomes with up to four slide-outs, but that still is less than what the double decker can provide in a fixed, always available configuration. The bottom line is – on side-parking areas along highways or some large parking lots in the city you cannot camp. So while parking a double-decker motorhome in such areas you can rest and carry any “business-like duties” with the comfort of your home, it is not the case of standard slide-out based motor-homes. Their interior does not offer you such accommodation in the “Travel Configuration”! Driving the double-decker motorhome requires more skills. Obviously due to its height, the center of gravity is located higher than in any single-deck motorhome. As a result double-decker motor-homes are more prone to lose stability on bends if the speed is "excessive". It may be dangerous to drive such vehicles in windy conditions; especially sudden wind-gusts can badly “destabilize” the vehicle. 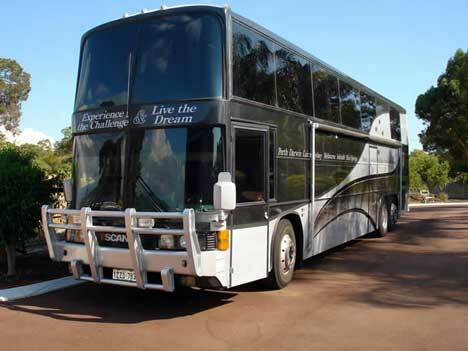 Most “affordable” double-decker motor homes are those “home-made”. The starting point is usually chassis of one of the commercial busses like Scania, MAN, Volvo coaches or traditional English double-decker busses. Typical floor- plan calls for bedrooms and bath on the top level, while kitchen, dining & living area, toilet and lockers on the lower deck. Both decks are connected by one or sometimes even two access stairs. Other amenities that may be of interest to the reader are: 132 gallons (500 liters) water tank with water pump, generator, 2.5 kW inverter, refrigerator and freezer, stove, heater and AC units, TVs, Audio/stereo, retractable awning and more…. Well, such marvel really can be called Home! For details see "Majestic double-decker Motor-homes"
This double-decker luxury motorhome is made by German company Neoplan. Right from the start, it should be mentioned that only some dozen of such motorhomes were built (so far). However, the truth is that “Jumbo-cruiser” is not a kind of “Once-upon-the-time-one -extravaganza-unit” project, but a serial although limited production line of luxurious giant motorhomes targeting mainly business and entertainment industry as well as very wealthy individuals. .
And just for the record – Jumbo-cruiser holds Guinness Book record as a largest, road-registered motorhome. To get better idea here are some numbers: 59’1” (18m) length , 14’1” height, 8’2” (2.5m) width and 61,730 lbs (28 metric tons) weight! 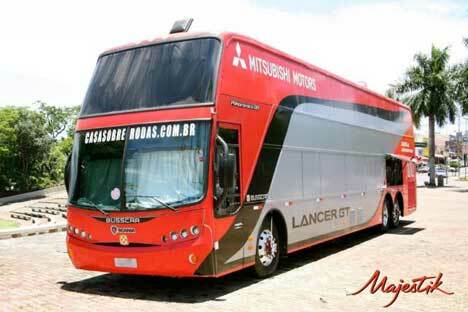 To make it rolling, the vehicle is powered by the Daimler-Benz, 12 cylinder diesel-injection 320kW engine. And shortly (as you can imagine, the Jumbo-cruiser’s interior includes so many features and amenities that the whole article can be dedicated just to its description): The motorhome has 8 permanent (travel) seats for passengers and includes VIP lounge with bar (and all what barman may need ! ), living room, spacious kitchen, dining area, bathroom, two bedrooms and small garage in the rear section (for bikes, ATV etc…). Due to the mentioned height’s limitations there are not many double-decker motorhome cruising US roads. One of the exceptions is a DecoLiner built by Randy Grubb on the chassis of a GMC motorhome. It is an “Open-top” double-decker motorhome and although the upper level includes also the “Control Bridge” (in other words driver’s cockpit), it is mainly designed for fine weather conditions. The fact that only one model was ever built confirms the reality – you will not find many double-decker motorhomes on US roads. May be this will inspire some to visit Antipodes? watch the whole story of DecoLiner project by Randy Grubb! Another known (let’s say “well-documented”) US case is that of Hornor and Welsh. 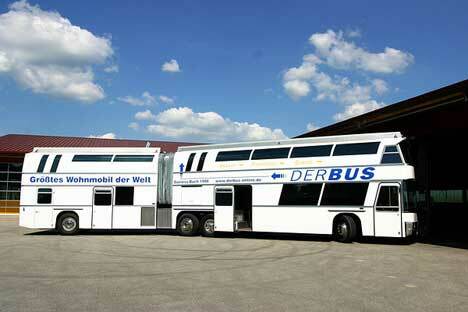 They use a German double-decker “Spaceliner” (manufactured by Neoplan) converted to the motorhome. To make it clear - the unit was completely re-furbished by professionals (so, this time it is not a “home-made” one). After the last touches to their new motorized home were done, the couple rented their traditional home and started their Odyssey across the continental US. As they joke - to visit Hawaiian Islands they have to wait for a bridge or tunnel! To read more details please check "Road Odyssey"
To summarize – the double-decker motorhomes are not the mainstream of RV industry. In US you can find some in “reduced” to 13’6” versions, but mostly these are made as custom-built units for wealthy individuals. Imagine having a double decker motor home created from a double decker bus. This project could find you with an upper level bedroom and a lower level dining, sitting and bathroom facility. RV motor home owners who have had the chance to take a double decker bus and convert the areas to suit their needs have a complete traveling home. Yes, the RV motor home is luxurious, but the idea of two stories intrigues people as a great way to travel and live. You might find a 1992 or 1993 two level bus that has the potential to convert the areas over into a great home away from home. Now if you live in Massachusetts or Michigan, you may not have ever seen a two level bus or RV motor home. The bedrooms on the upper level could have separate entrance from a hallway, while the lower level could have the dining/kitchen area completely separate from the living room. This type of traveling does not compare to a pop up trailer. The room you have would compare to a small apartment, but on wheels. The way to travel, but the price of fuel might deter some people because of the wind resistance that seems to use more gas. If you could make the upper level with an angle like some of the camper vans and semi trailers have you would be all set. The double decker motor home sure does offer you some great adventures. One place I know you can find buses to convert over and design your own RV motor home is London. The cost to ship a bus of this type to the United States may be a bit steep, but when you think about the money, you save by building one yourself verses buying a manufactured one might just even out in the end.